GenemerTM Control DNA are cloned fragments of a particular gene for use with gene or mutation specific GenemerTM and GScanTM products. These control DNAs are ideal genotyping templates for optimizing and performing control amplification with unknown DNA. One tube is supplied containing 500 ng of lyophilized DNA segment of the specified fragment spanning the mutation region. The quantity supplied is sufficient for 1000 regular 50 µl PCR reactions. The control DNAs were developed to complement Gene Link&apos;s gene detection system product line. The control DNAs for a single base mutation are helpful to optimize the protocol and in setting up positive control standards. 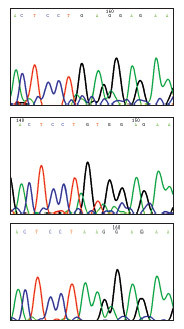 The control DNA series for various triple repeat disorders were generated by amplification. These serve as controls for the amplification of various triple repeats and to run as positive controls. 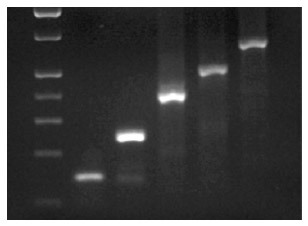 The size of the triple repeats has been determined by sequencing and gel electrophoresis. The stability of size repeats upon cloning and amplification has not been determined. Thus, the size should be considered approximate and there is no claim for each fragment to contain the exact number of triple repeats. These control DNAs are sold with the expressed condition that these not be used for exact triple repeat size determination of DNA of unknown genotype. The control DNA should be used for determining the performance of specific GenemerTM, GScanTM and PCRProberTM Gene Link products. Lane 1 is molecular weight markers. Lanes 2-6 represent PCR products from DM genomic clones that contain 12, 45, 93, 129, and 182 CTG repeats respectively. 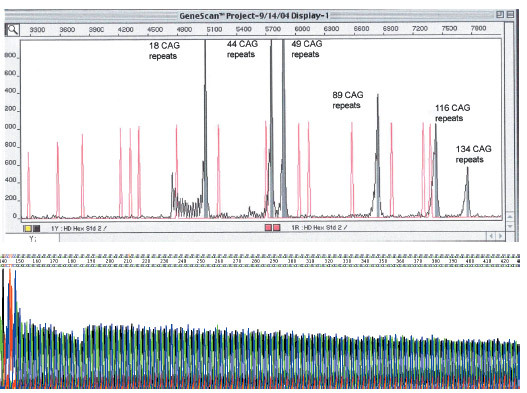 Sickle Cell GenemerTM control DNA for Hb-A, Hb-S and Hb-C.
Huntington&apos;s Disease GenemerTM control DNA of various CAG repeats shown here used for GScanTM analysis.